FILE - A vehicle with Sudan People's Liberation Army (SPLA) soldiers travels past the Paloch oil field facility in Paloch, Upper Nile state, South Sudan, March 2, 2014. The United States is slapping trade restrictions on 15 South Sudanese oil entities that are partially owned or run by the South Sudan government. The U.S. State Department said Wednesday anyone wanting to export or transfer items of American origin to the 15 entities must first obtain a license from the U.S. government. The 15 listed entities, which may include individuals, companies and private or government-run organizations, are to be published in the U.S. Federal Register later this week. 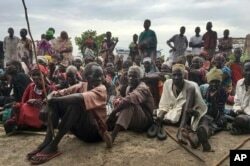 “Unfortunately, the South Sudanese government, and corrupt official actors, use this revenue to purchase weapons and fund irregular militias that undermine the peace, security, and stability of South Sudan rather than support the welfare and current emergency food needs of the South Sudanese people,” Nauert said in a statement. He says government entities that run the oil sector are being targeted exclusively, including the Ministry of Mining and the South Sudan Ministry of Petroleum. FILE - South Sudanese, displaced by conflict that has raged since late 2013, are seen outside of a U.N. protected camp, in Bentiu, South Sudan, June 18, 2017. “What will happen is that the ability of other companies to trans-act with these companies is going to be in jeopardy. This is a warning to other companies that says if you’re dealing with these South Sudanese companies, you are breaking U.S. law and therefore liable under U.S. jurisdiction,” Adeba told VOA. Adeba says the new restrictions will severely affect the supply of money the South Sudan government uses to buy weapons “because its oil reserve is the only way by which the government is able to get foreign currency” and to finance the activities of the government. The conflict in South Sudan has raged on for more than four years, despite a 2015 peace agreement and numerous declared cease-fires that have been broken repeatedly by government and rebel forces. More than four million people have been displaced from their homes, and aid agencies have said as many as six million are need of emergency food assistance. U.S. officials recently resumed a push for an international arms embargo on South Sudan. He hopes Europe follows the United States’ lead by imposing similar restrictions on South Sudan oil entities.